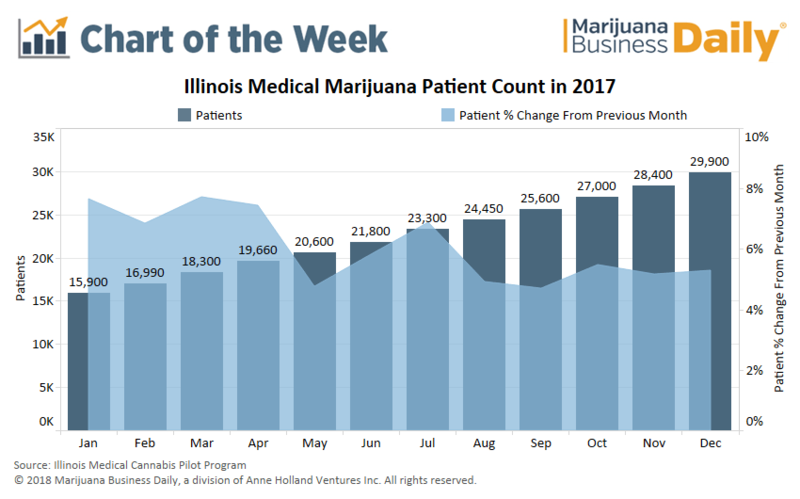 Illinois’ medical marijuana program grew at a solid, consistent pace throughout 2017, but the potential addition of intractable pain as a qualifying MMJ condition in the state could set the table for a breakout year in 2018. Illinois added 14,000 MMJ patients to its rolls over the course of 2017 – an 88% increase – with average monthly patient growth clocking in at a respectable 6.1%. Total retail MMJ sales for the year were approximately $86 million, averaging out to just over $7 million a month. While these metrics point to a healthy, developing market, business owners have long been urging regulators to relax the qualifying conditions list to allow more patients to enter the program. Steep licensing fees and strict regulations have placed significant financial pressure on the 53 dispensaries and 21 cultivators operating throughout the state. So a recent ruling by an Illinois judge ordering the state health department to add intractable pain to the state’s list of qualifying MMJ conditions came as welcome news to these businesses. Intractable, or chronic, pain is the most oft-cited condition treated by MMJ patients in nearly every state where it’s allowed (New Mexico is the exception). The judge’s ruling is expected to be appealed by the health department, so it’s yet to be determined when or if intractable pain will officially be added as a qualifying MMJ condition in Illinois. In New York and Minnesota – the only states to add intractable/chronic pain as a qualifying condition in 2016 – patient counts increased by an average of 144% six months after the condition was added. If Illinois allowed intractable pain to be treated with MMJ in the first half of 2018 – and its growth pattern was similar to what played out in New York and Minnesota – the state’s MMJ patient pool could surpass 100,000 by the end of the year. I don’t doubt that many will move from Illinois due to their heavy taxing on almost everything. The patient number for 2017 of about 30,000 is deceptive as less than 20,000 are actual dispensary customers. There seems to be some sort of crunch. As a cancer patient, I applied almost 11 weeks ago with no response yet. I believe the application explicitly stated a 3-8 week response time. A call to my (hopeful) dispensary got the intel that patients have been waiting 60-90 days for a response. I’m not literally wasting away at present, but clearly the program was a sprinkling of compassion in a mound of criminal justice orthodoxy rather than a serious balancing of legitimate fact-based concerns. That said, taxes seem to be reasonable. My dispensary’s online product list usually has multiple strains on special for $30-35/3.5g. Rarer stuff can run up to double that, but even pure kief isn’t $1000/oz.